It's time to take control of your own financial future. Start-up costs and commissions can be as affordable in the Futures & Forex markets as they are within the stock market. For example, start up costs in the Forex market can be as little as $1,000, with a margin of $200. Day traders love trading Futures, and Foreign Currency (Forex), because you can short the Futures and the Forex market without margin interest; unlike the stock market, therefore you can trade the long side just as easily as the short side, take long and/or short positions when the market goes up or down and even use automated systems. Futures & Forex electronic markets trade 24 hours a day, five days a week, and some even trade on Sunday! Currency traders can trade 24 hrs. a day, from anywhere in the world, full time or part time, wherever you can gain Internet access with your Forex Trading Platform; sitting on the beach, or hiking in the mountains, during the day, or trade in the evening. Trading future and options can be one of the most fascinating methods of trading; when trading options, you can buy a call, if you believe the futures market is going to rise, or buy a put if you believe the futures market is going to fall in price. The best part of trading options on futures, is that when purchasing an option, your risk is limited to the premium that you paid for the option, and you cannot lose any more than that paid premium. This is one factor that makes trading futures and options so attractive. You can gain a tremendous amount of experience by trading your free practice/demo account; trading what we believe to be the best trading systems in the world using our proprietary top trading software on Autopilot. * Even trade the eMini S&P, & the Dow Jones on live Dow charts! 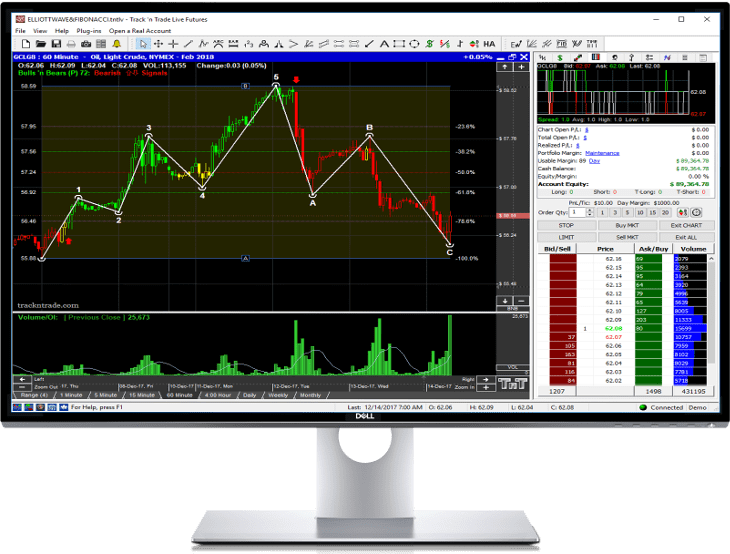 When trading Futures & Forex the choices are far fewer than when trading stocks, which can allow you to focus your research time to only 3-5 markets, quickly get down to the business of trading, not analyzing, and in our humble opinion, using the best trading software available. Don’t take our word for it, take a free 14-day trial today. All Track 'n Trade Software, Plug-ins, and Data Services come with a FREE 14-Day, no risk trial. Trade with the famous Bulls 'n Bears Advantage Plug-in! You can also set up your own unique trading systems using the Autopilot for Track 'n Trade LIVE Futures or Forex. Our customers are #1 and always have been the entire 19 years we've been in the software business. You come first! Call us TOLL FREE for any technical questions. Talk directly to an in-house skilled technician who will help solve any issue. Each product you invest in includes multimedia educational training that shows you how to use each tool with skill and confidence.